resources to do the job right. quality because in any small cities such as Superior, that would be an enormous financial burden. the mayors say they want to be part of the federal Great Lakes Advisory Board. Earlier Spring Thaws to Accelerate Global Warming? more than a week earlier than it did in 1988.
the reason for the increase in heat-trapping gases. releasing methane and carbon dioxide. like automobiles and power plants. behind other developed countries in its financial support for renewable energy projects. Diane Humphries is with the oil company Suncorp. The company’s investing in wind power. the federal government to increase its investment. The gift-giving season has come and gone. Some folks ended up with sweaters that were two sizes too large; some folks got sparkly baubles; and lots of people were the beneficiaries of gifts promising to simplify their lives – including their work lives. With millions of Americans working out of their homes, Great Lakes Radio Consortium commentator Julia King thinks home-office life after the holidays is going to be smooth sailing! Or is it? commentator Julia King thinks home-office life after the holidays is going to be smooth sailing! me recording equipment for Christmas. I’m his very favorite NPR commentator. I think. that the engineer would show up. Hey, Sweetheart. Mommy’s working here. Can I get a little cooperation? Thanks. (MAN YELLS QUESTION IN BACKGROUND) I think I saw it in the upstairs bathroom. for Christmas. Yeah. Isn’t that great? Okay, I’ll talk to you later. Bye. minor disagreement about my importance. You know how that is. aspect. Now it’s like all my problems (DOG BARKS) are solved. Can somebody let the dog out? Christmas. I hope he gets me a snow-cone maker. us by way of the Great Lakes Radio Consortium. horses, and they seem fearless. But biologists don’t know much about many moose populations. Northeastern Minnesota. The forest is twice the size of Delaware. Fond du Lac band of Chippewa. He says they’d like to know why there aren’t more moose here. There are several possible reasons. The helicopter crew has spotted some moose. lake, where they can get an easy shot. landing to pick up a radio collar. animals in one year. But researchers admit there could be a 25% margin of error in those figures. bull. He’s lying on his side in the middle of a huge frozen swamp. They take blood samples to check on hormones and blood chemistry, and to look for disease. 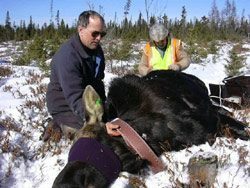 Delgiudice even uses an ultrasound machine to measure the fat in the moose’s rear end. its hair. They aren’t all so lucky. Some of them have scratched a lot their hair off. <"Rick yesterday saw a calf of one of our cows that was what'd you say Rick, only 25% hair. So that one's been rubbing and scratching for a long time. And, of course, when they're doing that rubbing and scratching and biting, they're not foraging, and it can drain them over time." tight, it can bind, especially in the fall mating season when the bulls’ necks get thicker. him immobile for about half an hour. The moose struggles up, stands for a minute, and then saunters off toward the trees. That’s moose number five for the day. The team is planning to track 60 moose for five years. It’ll tell them what kills these moose and what’s keeping the population from growing. For the Great Lakes Radio Consortium, I’m Stephanie Hemphill, in the Superior National Forest. grass, you can get rid of about 90% of your cow problems. long art portfolio. It was outrageous. But even more surprising – Ottawa is full of these people. the temperature is well below freezing. developer. And an avid winter cyclist. helmet over my ski cap. sweating, the biggest challenge is often to stay cool and dry. As soon as we reach the driveway, Weichart is smiling. He eagerly brushes the snow off his bicycle. and I hop on our bikes, inching them towards the top of the driveway, which is covered with ice. get out on the main road, we’re going to have dry pavement. skating. Weichart tells me to steer and brake, but preferably not at the same time. drivers see people on bikes. mostly, he says he just loves being outside. he’ll choose the longer, scenic route to the office. Today is no exception. 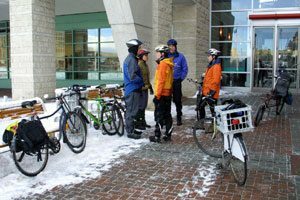 Want to commute to work in the winter? and the kids to get on. 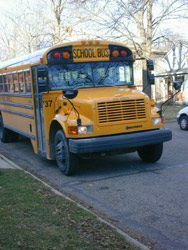 Not every school district uses diesel school buses, but many do. more than just creating a nasty stench – it’s putting their kids’ health at risk. particulate matter, the soot released from diesel trucks and buses, is a leading air pollutant. Minnesota and Connecticut already have anti-idling laws in place. breathing. And they feel progress starts when the buses are turned off. For the Great Lakes Radio Consortium, I’m Erika Johnson. 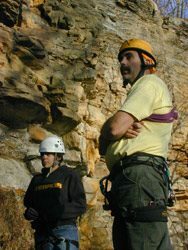 Rock climbing has been considered a sport since the early twentieth century. “Let’s get you up here. Bug, you coming up here? Let’s do our commands..
also might be the last time they’ll ever climb here. most of his income from teaching here. And you can tell he loves his work. But he says, after today, he won’t teach another class here. topsoil at the cliff’s edge. And even the rock is vulnerable. as far away as Detroit, Ohio and Indiana. 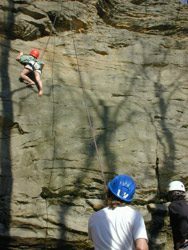 commission to consider banning climbing at the park. That’s stirring up the climbing community. 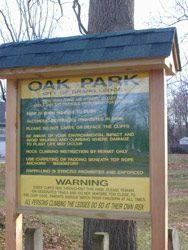 local climbers is asking the city to keep the park open. park closes, she’d have to drive to Kentucky or Canada to climb outdoors. be a very extreme measure, there needs to be some management of the area. But Michael Hood isn’t sure anything short of a permanent closure will work. is known about cliff ecosystems because they’re hard to get to. decision he came to easily. ropes down and pack the helmets into bags. Hood gathers the kids in a circle. climbing in a place he loves. Geoff Rathbone is Toronto’s director of solid waste management services. to plants for processing and separation. picked up, encouraging them to recycle. So far they’ve cut waste by 40-percent in just one year.